Counterfeit Kit Challenge Blog Hop! Hi! If you’ve never been here before, welcome and thanks for visiting! Today is the Counterfeit Kit Challenge Blog Hop. I just discovered this challenge blog this month, and really love the concept. You can check them out here if they are unfamiliar to you or if you’d like to check out the blog hop from the beginning. And you can check out all of my Counterfeit posts by clicking here (and I still have more stuff to share from this kit, so please come back!). From the original, I kept the cockeyed orientation of the two side by side photos, stuck journaling off to the left, and built the title to the right (although it is moved down more to center since the righthand photo was horizontal orientation, and thus longer than the original layout). (Also, the ice cream cones were originally homemade flower embellishments, but a little crimped paper turned them into waffle cones.) 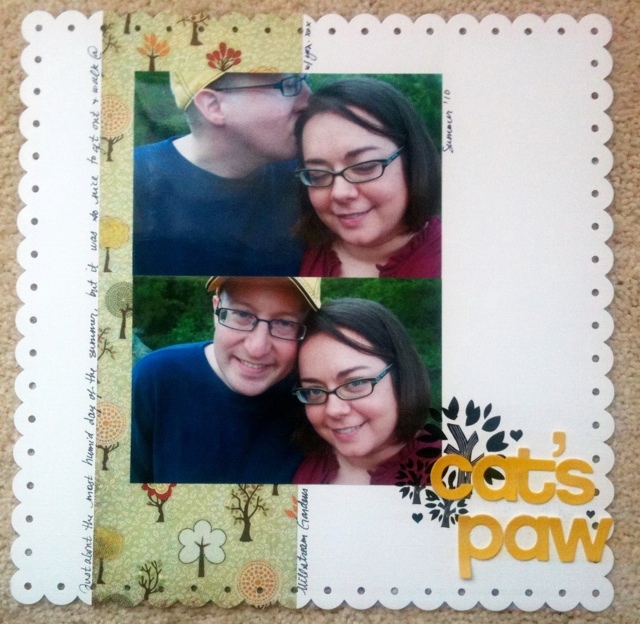 :-) I didn’t have a diecut background piece, but used a scallop border punch on the top and bottom to emulate that. I used rhinestone brads and glitter stickers to echo the bling used on the journaling block butterfly of the original. The original layout used non-vintage, but vintage-looking Jenni Bowlin paper. I used some vintage-looking paper (the retro couple background piece and popped by the title) and some actual vintage (shorthand training manual). What do you think? Thanks again for stopping by, and enjoy the hop! The next stop is Jessica’s blog–click here to visit! Placed the title to create a green-outlined-in-brown visual triangle with the leaves on the top and bottom right. Used my Silhouette to cut said title. Gotta love that offset feature!! You can see that I ended up having to go with a general feel… And 2 of my pp subs are large scraps, not a full sheet of paper. I also just stuck in 2 sheets of blush cardstock and will make the lace paper using my Silhouette when I get to that point. I pulled from my vintage stash for the papers, but added a few individual pieces that I thought went with the kit, including this vintage matchbook cover, a vellum collage piece, and a vintage scripture card. Sorry for the horrible photo. (I made this kit while still on bed rest, and so took pics with my phone so I could upload them easily.) I made the flowers while lying on the couch. Just cut some circles of tulle, tissue paper, and fabric, then layered and stuck together with a rhinestone or pearl brad. They are super cute in person. I’ll try to get a better shot when I upload the layouts. These are a little better… I threw in the big white flower, skeleton leaves, and 2 chipboard phrases because I saw them, liked them, and thought they might go with the layouts I was planning on making. I just uploaded a TON of photos to Walgreen’s. They have a coupon code right now through tomorrow–LUCKY25–you upload 50 prints and get 25 of them for free! Thought it was a decent enough deal, and I’ll have plenty of photos to scrap for awhile. :-) Have a great weekend! I did a movie on my phone that I had originally planned on sharing here, but you can’t really edit those and I grew unmotivated to mess with it. :-) But I do have pics I snapped of each step of my process so everyone can get an idea of how I’ve been doing this on bedrest–without worrying that I am in anyway endangering my baby. Those of you who are familiar with my story know how long we’ve waited, and how special the bean is, so of course I wouldn’t be up more than my doctor has told me I can be. He lets me up 10% of my day–so all I have to do is carefully manage that time. I keep track of meals, bathroom, shower, etc. so I know I’m not going over my limit. So, here goes! Step 1) In bed: I sketched out my idea for the layout, going off memory on what pics I have waiting to be scrapped, and referring back to the picture I snapped of my kit contents on my phone. This way, I could even notate specific supplies so my time up would be used efficiently. Step 2) 3 minutes up after shower: I pulled my needed supplies from my kit (took less than a minute) and spent remaining time trimming photos to be sure they would fit the space I thought they would. Step 3) 2 minutes up after lunch: Adhered photos. Step 4) 3 minutes up after a RR break: Trimmed and adhered patterned paper strips. Step 5) 2 minutes after dinner: Skipped cutting letters with my Silhouette as I’d originally planned (it was getting late in the day at this point, and I wanted this one done! ), and threw together most of a quick title block with kit contents and a pen. Step 7) 3 minutes after RR break: Adhered buttons, and voila!!! FINISHED! :-) Took all day, but only 13 minutes up! :-) Sorry for the small pics, but I can’t enlarge them too much, confidentiality, etc., for our foster kids this summer. Thanks for visiting! 1) I’m a simple scrapper. It took less than a minute to pull out the supplies I wanted to use–which was further aided because all of the supplies are already pulled out to be part of the kit! 2) I sketched everything out before hand while in bed, since I knew my kit contents, and I had already decided what pictures I would use, from memory, based on what I had that fit the theme of the kit. 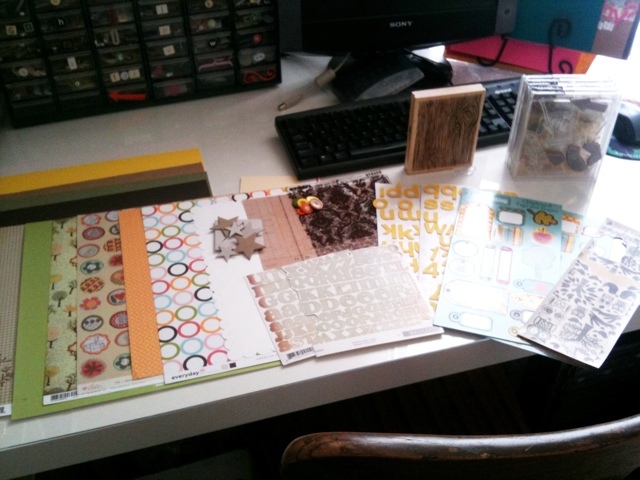 3) I’m an organized scrapper (at least right now). My space has been kept clean and things put away where they belong ever since I moved into the guest room in January. Sharing that space with guests and my husband (we moved our desktop computer in there, too) has really kept me on the ball. That helped me put my kit together in little 1-2 minute bursts (still took 2 days! lol), and helps when I need to grab an extra piece of paper, my trimmer, or adhesive–it’s all within arm’s reach. Counterfeit Kit Blog, have you heard of this?? So excited to find this blog! Check it out here. 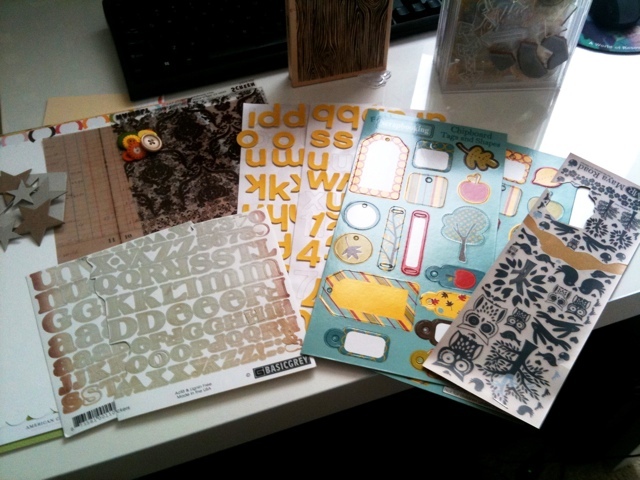 Each month, they pick a kit to “counterfeit” with their stash, duplicating the patterned papers, embellishments, etc. with things they already own to create a kit for $0. LOVE THIS CONCEPT and am completely kicking myself that I never considered it before! T swears I have, but I don’t think so… I would make homemade kits all the time, but I never thought to try to duplicate a kit that I was jonesing after when I had enough things in my stash already… Such brilliance. 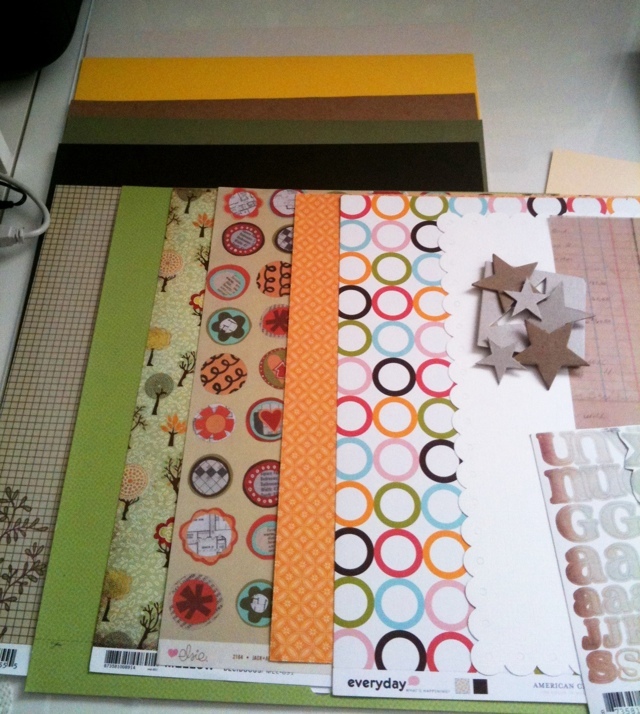 Cardstock for cardstock. I had every color they had in their kit, so that worked perfectly. And… last but not least…. 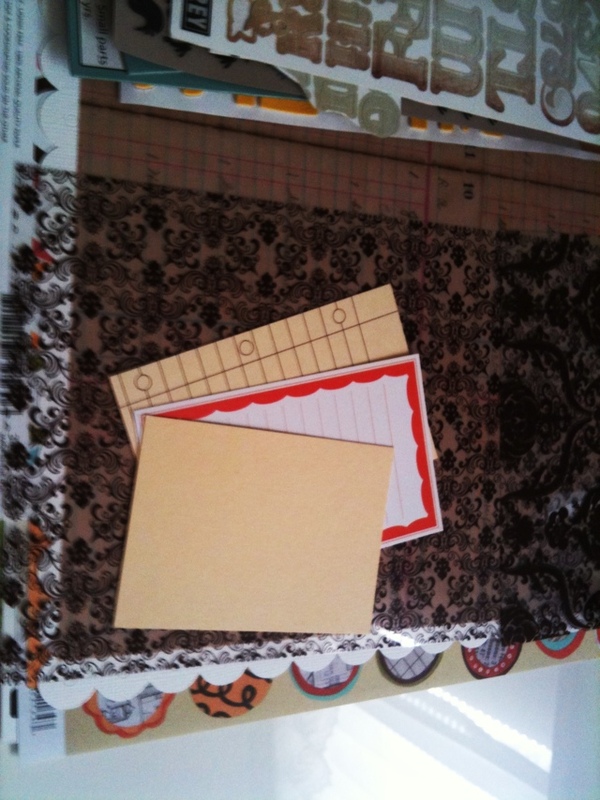 yellow title block and mushroom journaling card : journaling spots, ready to alter! There are add-on kits to lift, too, but I am sticking with this one for now, and once I run out of layout ideas (I think I have 4 right now), I’ll pick an add-on to counterfeit and use with the remainders of my main kit counterfeit. So much fun!!! What was that one thing she wrote about? Where is that one post? When did she write that one thing?